The research for this article was done by Kim Heath and Randy Sands with contibutions by Tom Johnston and Bill Collins. 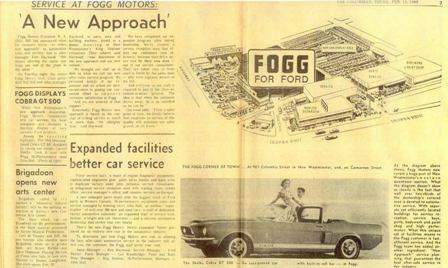 Fogg Ford was located in New Westminster, British Columbia, Canada. It is located about 16 miles outside of Vancouver. The dealership was established in 1927 and has a long history with Ford performance automobiles. Fogg was heavily involved in racing during the 1960s and sponsored several sucessful cars. The picture above shows the company president William "Bill" Hill with a new Cobra. The picture was taken in 1963 before the Canadian Auto Show. William Hill started with Fogg in 1938. By 1956, he was able to purchase the company. To say Fogg realized the value of sucessful racing would be an understatement. 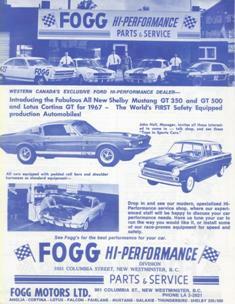 As soon as the 1965 Mustangs were ready, Fogg went racing. They used racing to sell the complete line of cars. These two pictures show Bob McLean's 1965 notchback race car. McLean was later killed at Sebring in a tragic racing accident. His Ford GT40 crashed into a ulility power pole and exploded into flames. This is a 1965 Shelby Competition model. The serial number is 5R533. 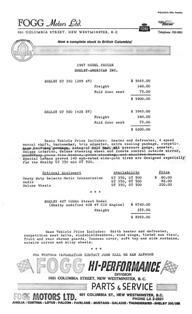 It was sent to Fogg Motors in March of 1967. It was purchased by Brown Brothers Ford and originally raced with a weber induction system. Photo courtesy of Rick Kopec, Shelby American Automobile Club. Fogg's advertising budget must have been enormous. 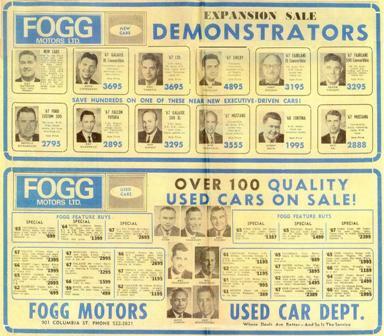 According to the ads, Fogg made some major improvements to the dealership during the middle 1960s. There properties encompassed over five acres and several city blocks. They offered their customers the full Ford experience. By 1967, Fogg was in full swing . . .
You can also check out the prices on this original Fogg letter. This vintage picture shows three 1967 Shelbys at Fogg Motors. Who would have thought that forty years later anyone would remember this sunny day at Fogg? The white car on the right is a GT500. Bill found this great advertising card. It is two sided. You can click on the picture above and see both sides in a larger format. Someone liked the picture above because it makes a nice backdrop for advertising. This car belongs to Randy Sands. The car is an original Fogg Motors car. It is 1967 serial number 31. 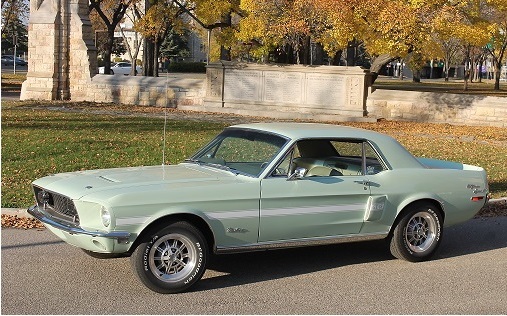 Randy's car was one of the first 1967 Shelby shipped to Canada. According to Randy, it was the only white, GT350, 4spd sold new in Canada. This decal was commonly placed on the back bumper of many of the cars sold new at Fogg motors during the 1960s. 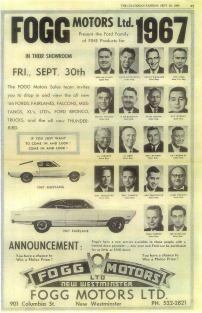 Most newspapers articles from the day featured stock photographs provided to dealers in the Shelby press kits. The lead times for newspapers and magazines was much greater in the 1960s. This newspaper article shows a 1968 Shelby convertible, but the car is actually a pre-production prototype car. You can click on this picture to make it larger and read the story. Gary sent me this picture of his California Special. I was not aware they were sold in Canada. The Seafoam Green looks great! Gary obviously likes the Shelby ten spoke wheels. 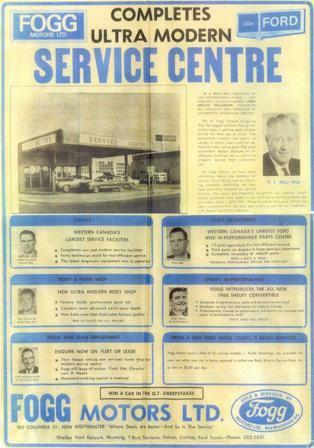 Let's take a look at some of the advertisements from Fogg Motors. You can click on the smaller versions to see the ads in a larger sized format. Proudfoot and Beetlestone are ready to sell you a used car, come on down! Fogg sold twenty new 1968 Shelbys. This newspaper photograph is from The Province. It is dated February 17, 1968. John Hall and Ken Haywood show off one of the first 1968s at the dealership. John Hall was one of Fogg's race car drivers. Haywood was the General Sales Manager. Although most of the cars sold were fastbacks, they did sell a handful of convertibles. On February 17th, 1968 the dealership only had one dark colored GT500 convertible. It was serial number 8T03S115948-00064. So, we know the car in the newspaper photograph above is # 64. A special thanks to Vinny Liska at the Shelby American Automobile Club for his assistance in determining that piece of trivia. This picture of # 64 was taken several years ago. The Shelby had suffered through nearly forty years of use. The car was for sale and on eBay sporting a color change. The original Fogg Motors bumper sticker was still intact. I am happy to report that it has been restored and is now the original color - Highland Green Metallic. Kim Heath's car is serial number 1362. The GT 500 has an automatic transmission. The Acapulco blue looks awesome next to the Pacific Ocean. Kim's car is very well detailed and is also an original Fogg Motors car. Kim's paperwork is extensive. Here is the export document. One thing for sure, there are no special notations indicating the car was unique. The urban legend that Canadian cars came without smog can be put to rest once and for all. Dan's special paint GT500 KR was sold new at Fogg. They actually sold two of the bright yellow cars. The lovely, young lady is Dan's daughter. Her name is Shelby. The car is still on the west coast. This 1968 Mustang notchback was sponsored by Fogg. John Hall used it to win the Canadian/Oregon/Washington Amateur Championship in 1968. This trans-am style Mustang was later replaced with a Boss 302. Jamie Moore was originally a mechanic for the team. I am not sure if he later became a driver ? This special paint 1969 was seen in the concours area of the Mid America All Ford Show in Tulsa, Oklahoma. The car was looking as good as new. I noticed the Fogg Motors decal and Fogg Motors paperwork. The owner told me the car originally had the Fogg Motors bumper sticker as well. Fogg sold several 1969 Shelbys and a few special paint cars. Here is that decal. It was located on the right side of the windshield. You can see the resemblance to the Ford oval. This same design can also be found in several of the Fogg advertisements. This is the Fogg Special - Boss 302. John Hall drove it to win the first race of 1969 in the Canadian/US amateur race. The previous year, Hall won the championship. This is John Hall in 1971 at the Knox Mountain hill climb in 1971. I don't see the Fogg sponsorship on the car at this time. The major sponsor was Castrol Motor oil and the car is also lettered John Hall's Car Craft. 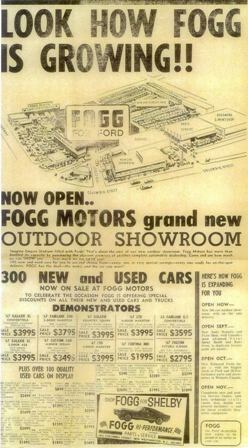 The original location of Fogg Motors was turned into a flea market in 1993. Today it is the location of condominiums and shopping areas.